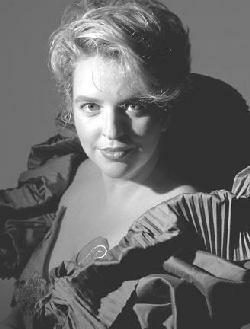 Soprano Karina Gauvin is a rising star on the Canadian classical music scene. Victories in several vocal competitions have propelled her to national and international prominence. Gauvin has already contributed to two recordings on Quebec’s Analekta label: Beethoven’s Egmont (FL 23105), and Bach’s "Little Notebook of Anna Magdalena Bach" (AN2 8251) with harpsichordist Luc Beauséjour (Analekta’s reported sales figures of 4000 units make the Bach album one of their most successful titles). 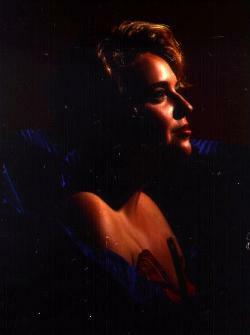 On October 6th, 1997 Analekta will release Karina Gauvin’s first solo album - Vivaldi motets accompanied by Les chambristes de Ville-Marie - in conjunction with a concert of the same program the same night at Centre Pierre-Péladeau (broadcast live on Radio-Canada: see calendar). Judging by the enthusiastic response to a free public run-through of this program at the Conservatoire de musique de Montréal before the recording sessions last May, the upcoming concert and disc should be another success. La Scena Musicale spoke with Karina Gauvin about the recording experience. LSM: How many recordings have you made so far? KG: This will be my third for Analekta. For my first recording, I got a call from Luc Beauséjour who had heard about me from another musician. Luc asked me if I wanted to record the "Little Notebook of Anna Magdalena Bach". My second recording was the Beethoven Egmont with the Orchestre Metropolitain. Recordings are good for promotion. It’s also important to reach the people at home who may not be able to come to a live concert. LSM: Are you an exclusive Analekta recording artist? KG: No, each project has developed separately. For the Bach and the new Vivaldi recordings I have retained the copyright, though it’s not always the norm. It’s different for the second disc because it is an Orchestre Metropolitain recording. I control content, the cover and the layout. As artists. it is important that we have some control over our image. I negotiated my first recording contract, but now that I have an agent. She negotiated the Vivaldi contract. LSM: How did the Vivaldi recording come about? KG: Analekta’s representative heard me sing Vivaldi’s O qui coeli motet in concert with the Ensemble Amati in the spring of 1996. Analekta did not have any Vivaldi in their catalogue so their president Mario Labbé asked me to develop a Vivaldi project. I had carte blanche to put together a program. I went through the Vivaldi repertoire and selected my favourites. The whole process took one and a half years. I put the program together the same way I design a recital. Each piece has to be interesting in its own way, for variety. I don’t use filler. Naturally, O qui coeli is on the new disc. We also have a piece that has never been recorded before called Sum in medio tempestatum . It is quite a crazy piece to sing. The voice has to perform like a violin. There are many difficult runs and passages with no place to breathe. We also have Laudate Dominum that I think has only been recorded once. So the disc contains familiar and unfamiliar Vivaldi, with a good mixture of slow and fast tempi. LSM: Tell us about the orchestra. KG: Les chambristes de Ville-Marie is a seven-member orchestra that my husband Jean-François Gauthier formed for the recording. Because I helped pick the musicians I had perfect confidence in them. Jean-François played the harpsichord and the organ. Because we try to recreate period practices there was no conductor and tempi depended largely on my singing. Our whole group listened to a tape of the conservatory recital and made improvements for the recording. LSM: Where was the Vivaldi recorded? KG: The recording sessions were held at the St. Augustin de Mirabel Church, the same as for the "Anna Magdalena" recording. People think you can do 100 takes and piece together the good parts, but that really doesn’t work. The real challenge is to prepare the imagery in your mind as you would for a live audience. To produce this one-hour disc took one day for the sound check, then three days of four-hour sessions and another day of a two-hour session. When I wasn’t singing I took ten minute breaks. I was just eating, singing and sleeping. By comparison, my twenty minutes on the Bach recording took three three-hour sessions. The musicians were arranged in a semi-circle at the altar. I faced the orchestra from an elevated platform about ten feet down the centre aisle. I had my microphone and they had theirs. With this arrangement, they could see my every move and my breathing, and could follow me but it was far enough that they also had to listen to me. We had a wonderful team who always gave 100%. Each of them brought something special to the work. The recording process is emotionally wonderful but physically exhausting. I had to put every drop of energy into the sessions because every second is recorded. In a live performance you can’t expect perfection, but in a recording the mikes capture everything. LSM: Would you consider issuing a live performance on CD? KG: That’s unlikely because I am a perfectionist. When I listen to my live broadcasts I usually have some reservations. Even though I may have thought it was good, when I listen to it later, I sometimes find that I haven’t achieved what I expected. As musicians, we are in constant evolution, striving for perfection but never attaining it. When I work, I always tape myself. I’m hoping that one day I will be able to say "That was amazing" but listening to yourself can be a rude awakening. Sometimes, I get really depressed if I can’t convey my idea of the piece. I had a crisis with the "Anna Magdalena" recording - at one point I didn’t want it released. That’s part of being an artist. You have to have the humility to accept your limitations and work on improving. Perhaps in five years I’ll be more easily satisfied with my performances. LSM: Will the concert on October 6 differ from the recording? KG: The concert will be broadcast live, so there will be a lot of performance pressure. My interpretations might differ because I have developed new ideas since the recording session. But new ideas show that you are evolving as an artist. When you stop searching, art dies.